Dahlia tubers are underground structures which store energy for the plants they support. Each year, well-cultivated dahlias grow their tubers and make new ones which are used for vegetative reproduction. These two functions separate tubers from roots, which can take up nutrients but cannot store them. And the roots of most plants cannot be used for propagation of additional plants. 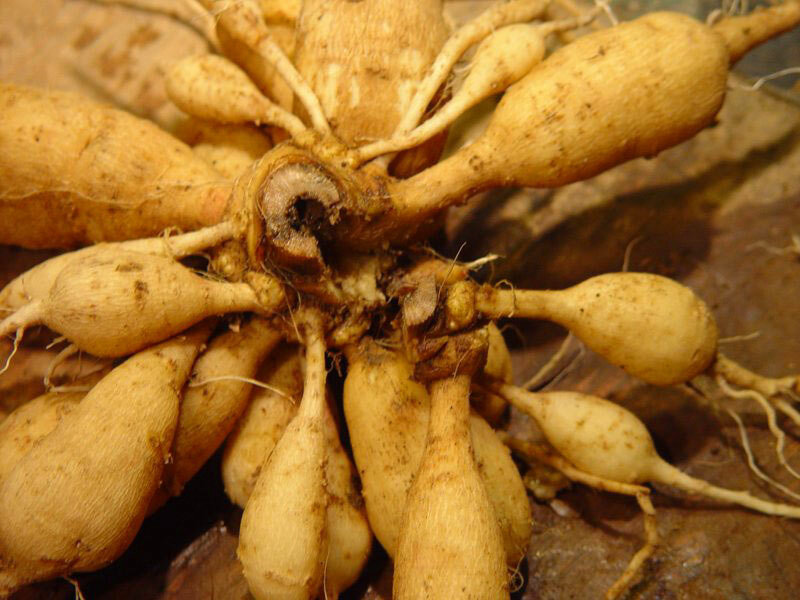 Tubers share their capacity for energy storage and reproduction with three other lumpy undergrounders: bulbs, corms and rhizomes. Bulbs are the best known; in fact, we hear people speak often of dahlia bulbs when they really mean dahlia tubers. Bulbs are rounded and layered; the innermost layer is a miniature, dormant plant, below which is a round plate from which the roots grown in a kind of pompom. In addition to the spring species like daffodils (we love Satsop Bulb Farm's) and tulips, lilies, amaryllis, garlic and onions are among the bulbs we encounter frequently. Corms look a lot like bulbs, but are solid inside. Unlike bulbs, which with luck go on year after year sending up blossoms and leaves which in turn nourish the bulb anew, corm-based flowers use up the energy in the corm from which they sprout. Through their growing season, they store energy in new corms. Crocus are corms, as are gladiolus and crocosmia; so, oddly, are tuberous begonias, though other forms of begonias actually ARE tubers, and no, we have no explanation for that oddity of the name game. The last category is the most root-like. Rhizomes are underground stems which grow shallow and horizontally, developing new sprouts or growing points at various points along their way. Calla lilies, waterlilies and many iris are rhizomes; so is ginger, though the edible part is often referred to as ginger root. All it takes is good soil and adequate moisture for a healthy dahlia tuber like the ones you get from Lynch Creek Farm to produce green shoots and lovely blooms. Through the process of photosynthesis, the moisture and nutrients the dahlia’s roots absorb from the soil and the sun's light combine to create sugars, energy that the dahlia stores as complex starches in its tubers during its growing and blooming season. Other tubers store energy in this way, too, and many of them are edible: some familiar tubers are potatoes, sweet potatoes and yams. Compare a dahlia tuber and a sweet potato sometime, and you’ll see remarkable similarities in shape and construction. But don’t eat your dahlias, please. Don’t leave them in the ground over winter, either, unless you have warm, dry winters. Like most tubers, dahlias must be dug and stored every year to continue to grow and bloom year after year in most parts of the country. Their moisture and sugar content makes the tubers vulnerable to freezing in cold spells and to rot in long wet spells during the winter, so dig your dahlias in the fall and store them for spring.